The BJG series Alcohol bottle filler mainly used in glass bottles filling. It is popular in alcohol drink filling industry, including wine filling, Vodka filling, Whisky filling, and Agave filling, vinegar etc. The bottle lid can be metal crown cap or aluminum screw-cap, plastic cap etc. In the alcohol filling system, bottle upgrade system can be constructed as mechanical mode or pneumatic mode, and the pre-holding parts ensure bottles perform smoothly. Based on innovative technique overseas, and designed according to filling processing demands of beer, Vodka, Whisky, Agave, wine or other alcohol drinks. Alcohol bottle filler for glass bottle includes the function of bottle rinsing system, bottle filling system and bottle capping system together. When the bottle enters into the bottle filling system of 3-in-1 monobloc Alcohol bottle filler through screw by convey system. Alcohol filling valve driving by the cam can realize moving up and down. Alcohol drink filling valve opens and alcohol filling start when it moves down and touches the bottle neck, the bottle filling valve lifting up after the alcohol filling process complete, the filled alcohol bottle moves forward to the capping position with star wheels. The guard plate holds bottle neck upright not rotating. It can complete a whole capping cycle, from cap fetching, cap pressing, cap screwing, to discharging through the action of the cam. Rotary bottle flushing system: good for cleaning up wine bottle, Vodka, and other alcohol soft drinks bottle. The rinsing contact parts and outer cover adopt the stainless steel material. The new bottle conveys through the separation screwer and star wheels by the gripper and turn over device; bottle neck is held upwards, after aseptic water flushing, the bottle neck moves up and delivered to next working position for bottle filling process. 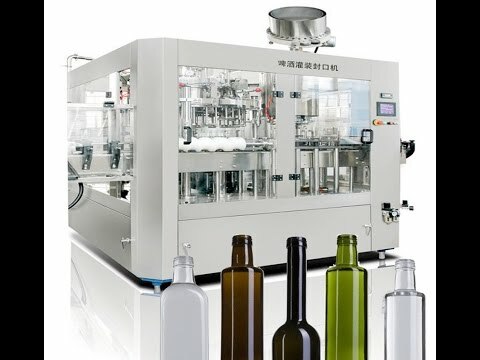 The bottle in place is installed with pneumatic parts, controlling the bottle convey stablely, avoiding the bottles falling down and enters into the main machine. Main drive adopt gear driving system independent, high efficiency, less working noise, long service life, maintenance-free, transducer can control the main motor speed, alcohol drink filling machine adopt variable-frequency variable speed. Alcohol bottle filling machine's valve adopts double vacuums to avoid oxygen left in bottles and extend the alcohol drink shelf life, with mechanical valve, High speed and big flow, the high accuracy filling valve, filling speed fast, the liquid level is stable. The important parts of alcohol bottling machine and electrical elements are imported units from oversea markets. Filling product can be controlled automatically and have CIP flushing connector. The performance of alcohol drink filling machine can be controlled automatically by PLC system. Filling product liquid level adopts liquid level probe controlling system, liquid level steady, filling in high accuracy. Rotary capping system knife stuck on the only bottleneck location, keeping the bottle upright and prevent rotation. bottle capping head to remain upwards in the revolution and rotation, under the action of the cam to achieve grasping cap, capping, cap pressing, cap off action, complete the whole capping process. Management of capping system is allocated in the top cover, through drop-cap rail and cover plate connected capping system. Completed bottle through the bottle capping system sent from the click wheel to the bottle conveyor chains, conveyor chains send out the triple play by the filling machine, into the next process. •Adopting equal pressure filling technique and current spring valves in order to assure beverage quality. •Japan PLC microchip control with touch-screen interface, full-automatic multiple-function of bottle flushing system, bottle filling system and bottle capping system. •JAPAN Omron photoelectric switches for solenoid valve. •Italy AROL capping technique, by using innovative magnetic coupler to regulate cap-screwing torque, in order to assure capping quality. •The gravity fixed liquid surface filling is adopted. •Spring cramps are used in the bottle flushing process. The empty bottles can be turned over 180° along the conveying rail. •The production capacity can be displayed digitally and can be regulated conveniently. •High efficiency of rinsing, there are two times of internal and external rinsing. •The magnetic torque is adopted for screw capping. •The power of screw capping can be regulated without steps. •Its performance is as following: all parts, for instance, filling valve, which directly contact medium, are made of stainless steel or harmless material. So it conforms to the requirements of Food sanitation. •Well protection for caps, the power of the screw capping can be fixed to avoid any damage of caps. •The amount of the drinks in the storage tank can be controlled automatically. •Bottle sensor is adopted, when there is no bottle, filing and capping will stop automatically. •Caps sensor is adopted, when bottles are cramped wrongly or when caps are not available, the machine can be stopped automatically.